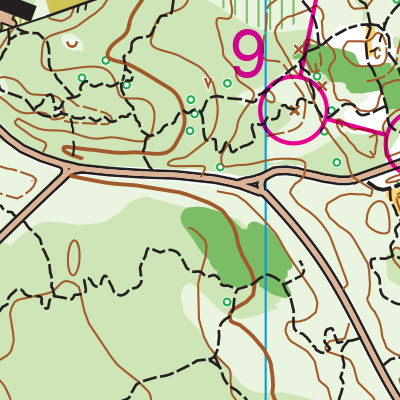 There are delights here for beginners and advanced orienteers alike. 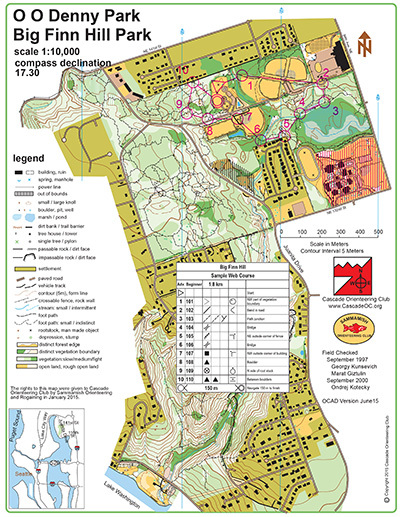 Buildings, ballfields, and trails provide a great beginner and intermediate area, while the forest is a giant knot of trails that can terrorize any advanced orienteer who becomes lazy about reading contours or using their compass to check the direction of the trail. The ballfields, buildings, and trails provide a great beginner and intermediate area. The forest on the other hand, is a giant knot of trails. To make it through this maze, keep close track of your current location on the map at all times. You can use your compass to confirm that a trail is going the right direction, and double-check that the contours make sense as well. While the ballfield area is fairly flat, the forest features some modest hills with trails of varying quality. Some lesser used areas can be quite steep. Turn right into Big Finn Hill Park and follow signs to parking. Take exit 22 for NE 160th St. Turn right onto 100th Ave NE, then quickly left onto NE 137th St. Turn left onto 87th Ave NE, then quickly turn right onto NE 132nd St. Turn right onto Juanita Dr NE.